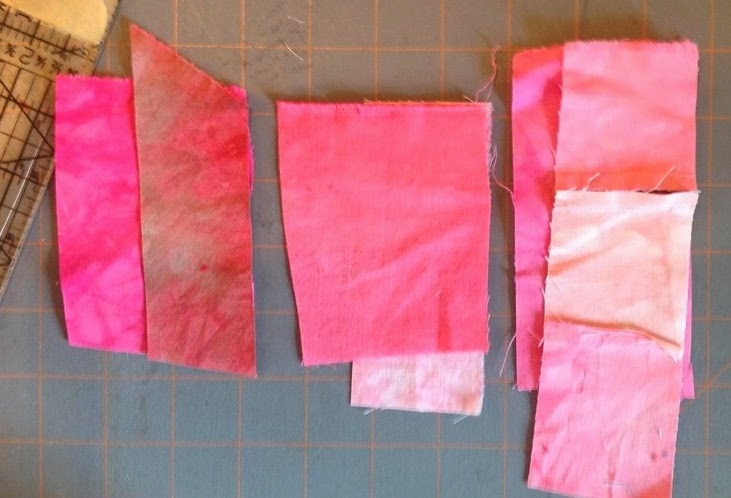 More than once during my week at QSDS, I was asked about my piecing method. I never really "learned" it from any place. Its just something I started doing to create a certain effect. 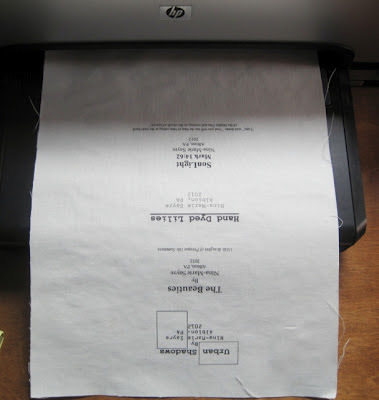 Since its not hard and the kind of thing you can personalize with your own style, I thought I would write up a tutorial. 1. 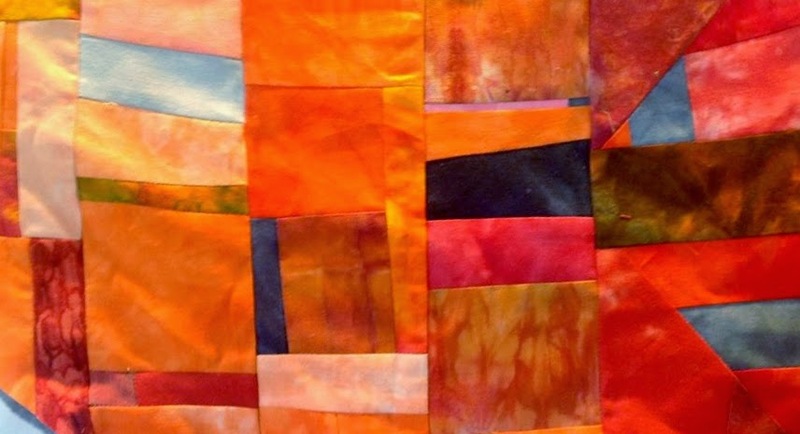 Choose Your Palette - Decide what colors you need in the space you want to improv piece. 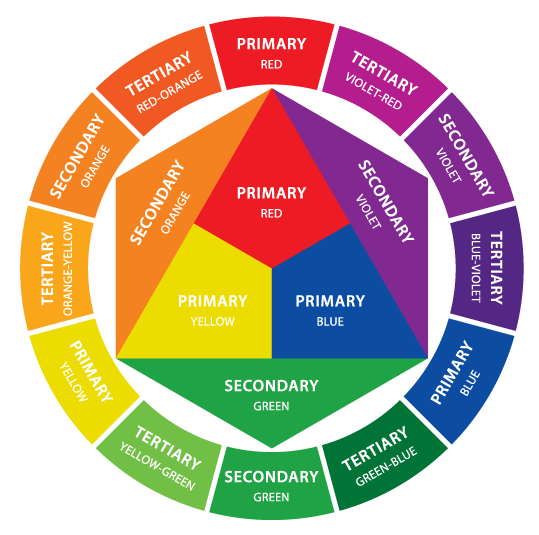 I do this two ways - I either pull out my color wheel (and all the color theory behind it) or I use a picture that I like to help me pick the colors. Either way make sure have a full range of values and saturation of the colors. Lots of times (like with the curves) I do a monochromatic palette adding in just a neutral color (black, grey, brown, white). Adding the different saturations of color and neutral is important since it will give the piece interest. 2. Lay Out Your Values and Saturations - I usually make little piles going from Light to Dark and the muddy saturations I keep on the side. 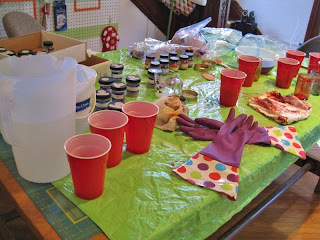 (Red Solo Cup Dye fabrics are perfect for the "muddy" fabrics). Cut hunks off each pile. How big the hunks are depend on how big the area you are making. 3. 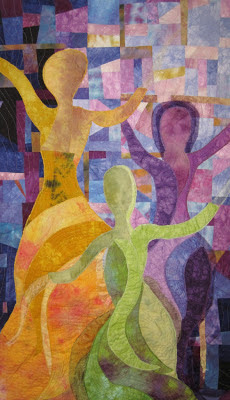 Cut the hunks into manageable pieces - usually 3 or 4 sided shapes 4 - 8" big (or whatever - you know how I am - grin). You want to pay attention to the values here. If you want an all over chaotic look you can mix all the values. If you want your piece to have a dark look - choose mostly darks with a few mediums and a very little light for spark. With a light area I just tend to stick to the lights with a bit of medium. I always make sure to add in some neutrals and a bit of an accent color. 4. Pair them together. Sew with 1/4" seam (or whatever). Iron. 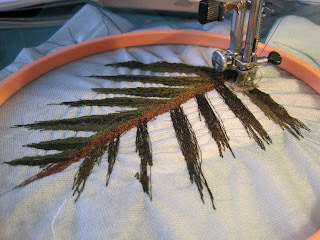 Trim off any uneven edges - making straight edges easily pieced again. Sometimes at this point I will cut a piece in half or on the diagonal or where ever to be paired with another piece of fabric. 5. Repeat step 4 until you have a bunch of interesting blocks of varied shapes. Mine tend to end up rectangles. 6. Decide how big a shape you need to improv piece. (If you haven't already) I usually have a tracing paper pattern that I can lay my rectangles out on - piece all the rectangles. Cut out the shape. If you're doing it for a background like in Praise ladies - I only pieced the background you could see - then used muslin behind The Ladies. It took a little thought process but it was a lot faster than piecing a whole background that you wouldn't see behind them. 7. Press With Spray Starch or some other stiffner. This is important. Once you've pieced and repieced and repieced the fabric, all those bias edges get very stretchy. The spray starch will add some stability and make your life a LOT easier. 8. 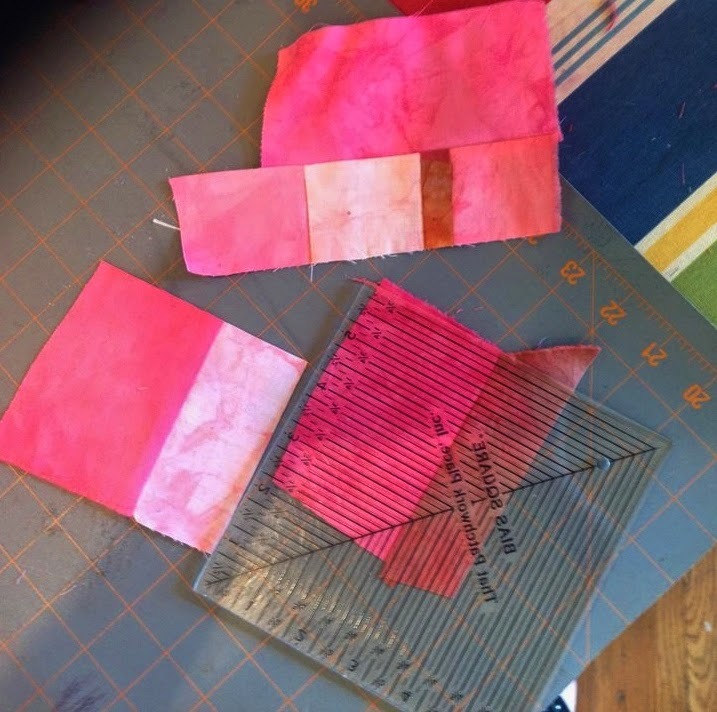 Cut the pieced improv pieces to the size area you need - using a pattern or dimensions. Give a final press and final trim. 9. Important - Save all trimmings except for the itsy-bitsy tiny ones. Through out the whole process this is true. 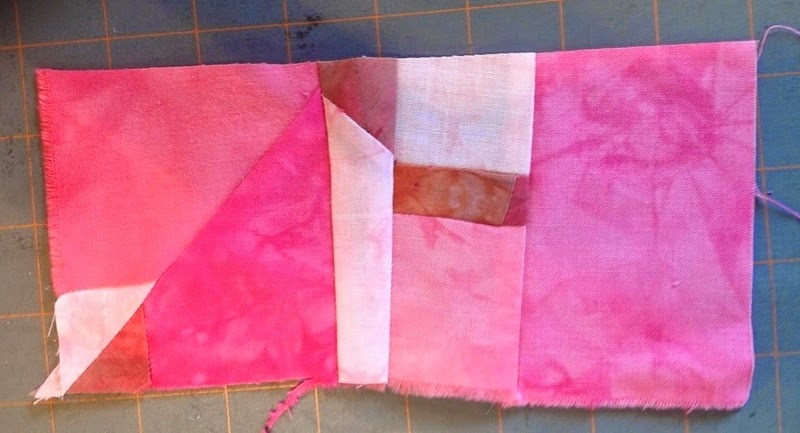 All the scraps can be pieced back into blocks which add surprising little gems of interest. 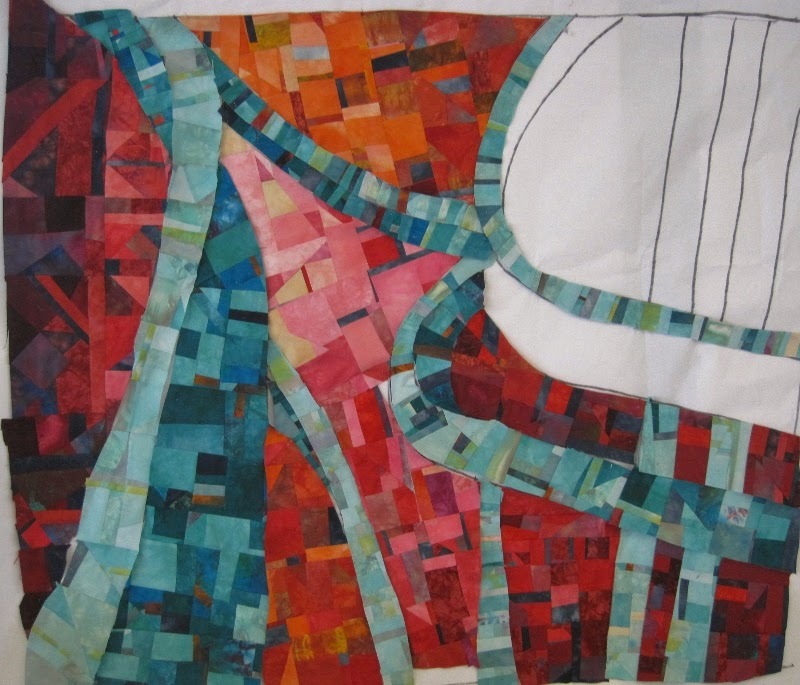 This will create an look of complex piecing without much effort. At the end, I save all interesting bits in a baggie by color. See Easy-Peasy, right? Things to remember - don't try to be too matchy-matchy. Mix in the saturations that you normally wouldn't think go together - like the warm greens with the cool greens etc. Remember the mood you are trying to create. Do you want a happy mood - use a lot of pure bright colors - sad mood - use a lot of muddy colors. You can choose a palette of neutrals with a bit of color for a calm mood. Also - think about scale - you can do this using big hunks of shapes or you can get as complex as your patience will allow. Please feel free to email me with any questions! Remember if you have your comments set to "No-Reply Comments" I can't email back. How generous of you to share your piecing method....thank you!! Nina, what a great tutorial! Very clear. 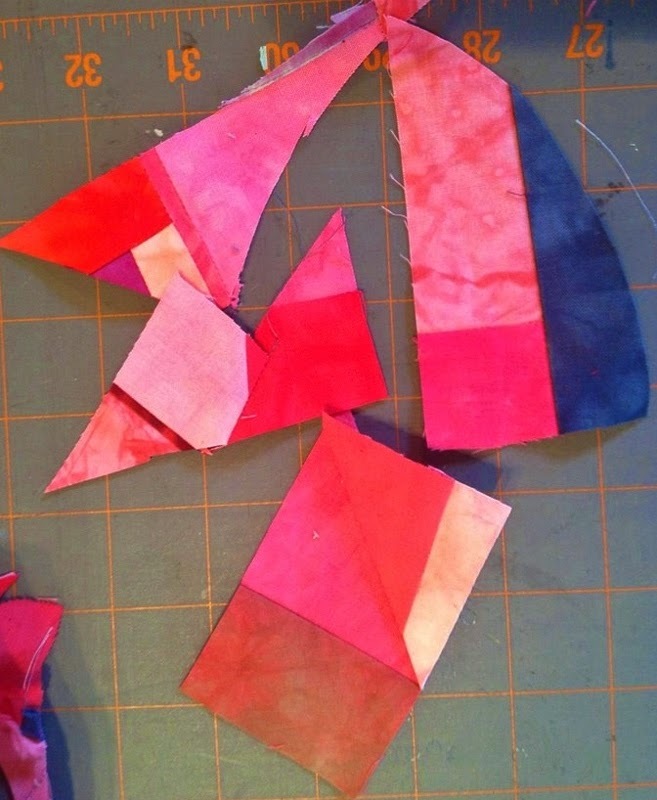 Thank you for the "hunk" method of improvisational piecing! I hadn't thought of starch but it makes a lot of sense. This is a great tutorial-thank you! Everyone seems to do it differently and I like your simple method the best. Thank you for sharing it. Love your approach. Thanks for sharing - just the idea I need to move me into a new space! What ever happened to your master class with Elizabeth Barton? I was thinking of signing up for it next year. Lol...June is a make-up month. I decided with Qsds I would take a month off to work on my own direction. It's back to the Barton grind stone this week I promise.